Who Is That Priest in the “Pawn Sacrifice” Trailer? 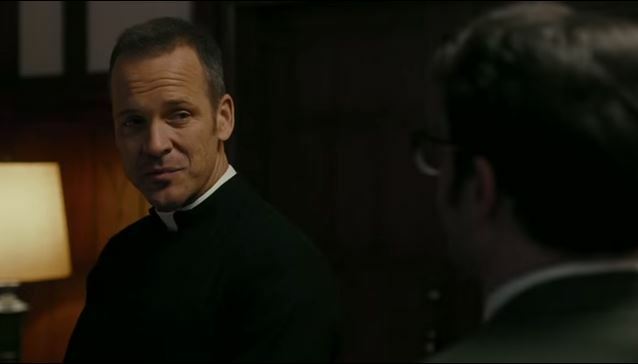 Some viewers may be puzzled by the prominence of a Catholic priest in the trailer. The IMDB entry doesn’t list the character’s name, but I can’t imagine it being anyone other than Fr. Bill Lombardy. Lombardy was an International Grandmaster who finished second to Fischer in the 1961 US Championship. Rather than taking his well-earned place in the international qualifiers, he retired and entered the priesthood. He left ministry to marry in the 1980s. He began coaching Fischer as a child, and when Fischer found himself in the spotlight in his legendary 1972 match against Spasky, he called Lombardy for help. Lombardy got permission to take a break from his priestly duties and flew to Reykjavik to help stabilize the troubled genius. He acted as Fischer’s “second” and is credited with getting Fischer through the match. He was coach, analyst, and friend, and it’s unlikely Fischer would have completed the competition without him. Fischer’s religious beliefs were notoriously erratic. Born Jewish, he later became a raving anti-Semite, joined the Worldwide Church of God, left it in a huff, and may (or may not: stories vary) have been a Catholic at his death.